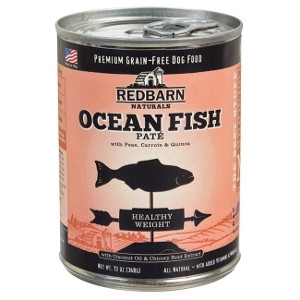 Redbarn's Ocean Fish Pate has high-quality Ocean Fish as our first Ingredient. Ocean Fish consists of seasonally available whitefishes like Grouper, Haddock, Mahi Mahi, Cod, Sole and Halibut. Coconut Oil, which is made up of Medium Chain Triglycerides (MCTs), help to support healthy immune function, as well as healthy skin and coat. Chicory Root Extract is a soluble fiber that may help to support a healthy digestive tract. Quinoa is a gluten-free source of protein and flavonoids that are plant antioxidants. 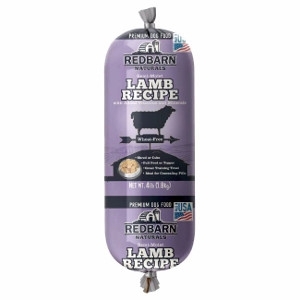 Redbarn's unique, low temperature cooking process helps retain vital minerals, vitamins and nutrients in the meat and helps prevent protein denaturation. These all-natural food rolls are more convenient than feeding a raw diet. Our Beef Roll is made with over 50% real meat and AAFCO certified for all life stages, from puppies to senior dogs. Just slice and cube the food and it is ready to serve. Redbarn's unique, low temperature cooking process helps retain vital minerals, vitamins and nutrients in the meat and helps prevent protein denaturation. These all-natural food rolls are more convenient than feeding a raw diet. Our Lamb and Rice Roll is wheat-free and made with over 50% real meat! 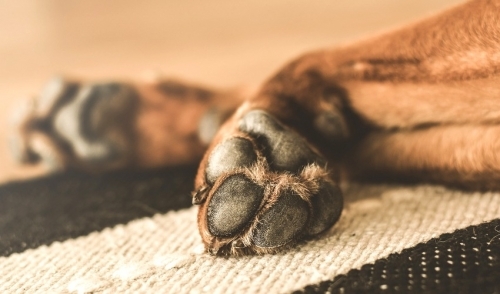 It's AAFCO certified for all life stages, from puppies to senior dogs. Just slice and cube the food and it is ready to serve. 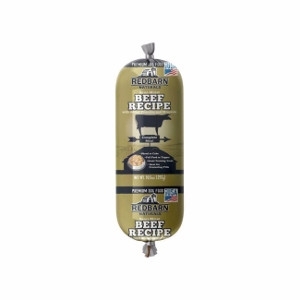 Redbarn's unique, low temperature cooking process helps retain vital minerals, vitamins and nutrients in the meat and helps prevent protein denaturation. These all-natural food rolls are more convenient than feeding a raw diet. 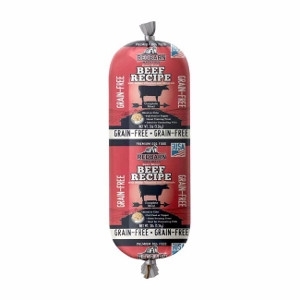 Our Grain-Free Beef Roll is made with over 50% real meat! It's AAFCO certified for all life stages, from puppies to senior dogs. Just slice and cube the food and it is ready to serve. Redbarn's Chicken Pate Joint Formula has high-quality Chicken as our first ingredient. We also added functional ingredients to support your dog's overall health: Dandelion Greens provide many vitamins and minerals and are high in protein. They are also a mild liver and digestive stimulant that may help support waste elimination. Healthy digestion is critical to support your dog's overall health. Green Lipped Mussels have many anti-inflammatory properties. They contain a unique combination of Omega-3s that help to support joint health and are a natural source of Chondroitin and Glucosamine. Redbarn's Turkey Pate has high-quality Turkey as our first ingredient. Salmon Oil, which is rich in Omega-3 Fatty Acids, may help to support healthy skin, coat and joints. Dandelion Greens provide many vitamins, support waste elimination. 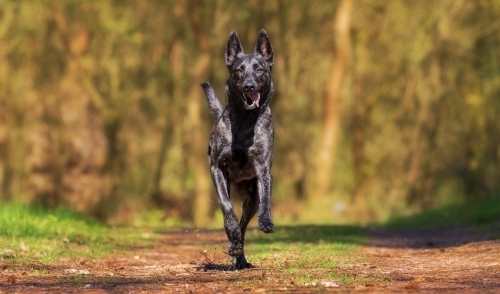 Healthy digestion is key to promoting your dog's overall health. 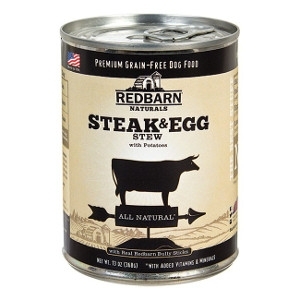 Redbarn's Steak and Egg Stew Canned Dog Food is a yummy breakfast stew made from real beef steak meat, potatoes and eggs. 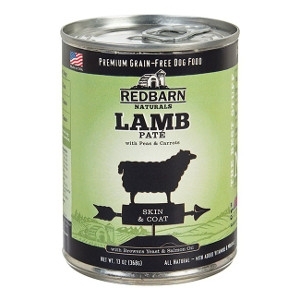 Redbarn Naturals Grain-Free Canned Dog Food is made from hand selected wholesome ingredients-fresh cuts of meat and poultry and garden vegetables all in a rich, delicious gravy. Redbarn's Turkey Stew is made from real turkey meat, cranberries and sweet potatoes (it's like Thanksgiving for your pup!). Redbarn Naturals Grain-Free Canned Dog Food is made from hand selected wholesome ingredients-fresh cuts of meat and poultry and garden vegetables all in a rich, delicious gravy. Redbarn Naturals Lamb Stew is made from real lamb meat, peas and a delicious rich gravy. Redbarn Naturals Grain-Free Canned Dog Food is made from hand selected wholesome ingredients-fresh cuts of meat and poultry and garden vegetables all in a rich, delicious gravy. Redbarn's Chicken Stew is a delicious chicken stew made from real chicken, peas and a delicious, rich gravy. 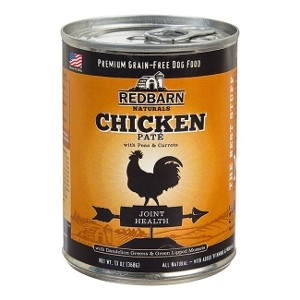 Redbarn Naturals Grain-Free Canned Dog Food is made from hand selected wholesome ingredients-fresh cuts of meat and poultry and garden vegetables all in a rich, delicious gravy. 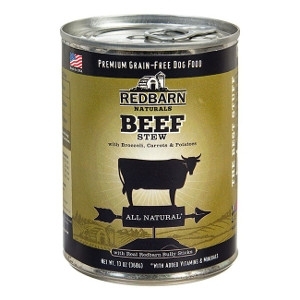 Redbarn's Beef Stew is a rich stew made with broccoli, carrots and potatoes and real bully sticks. Redbarn Naturals Grain-Free Canned Dog Food is made from hand selected wholesome ingredients-fresh cuts of meat and poultry and garden vegetables all in a rich, delicious gravy. Redbarn's unique, low temperature cooking process helps retain vital minerals, vitamins and nutrients in the meat and helps prevent protein denaturation. These all-natural food rolls are more convenient than feeding a raw diet. Our Grain-Free Chicken Roll is made with over 50% real meat! It's AAFCO certified for all life stages, from puppies to senior dogs. Just slice and cube the food and it is ready to serve. Redbarn's Chicken Pate has high-quality Chicken as the first ingredient. We have added some functional ingredients to support your dogs' optimal health: Dandelion Greens provide many vitamins and minerals and are also high in protein. They are also a mild liver and digestive stimulant that can help support waste elimination. Coconut Oil, which is made up of Medium Chain Triglycerides (MCTs), help to support immune function and healthy skin and coat. 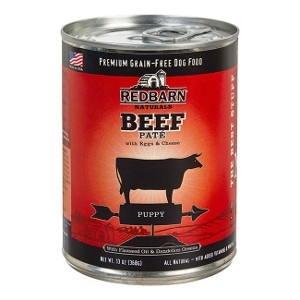 Redbarn's Puppy Beef Pate has high-quality Beef as its first ingredient. We added functional ingredients to help support your dogs' optimal health. Flaxseed Oil is rich in Omega-3 fatty acids that promote healthy skin, coat and joints, and their immune system. Dandelion Greens provide many vitamins and minerals and are high in protein. 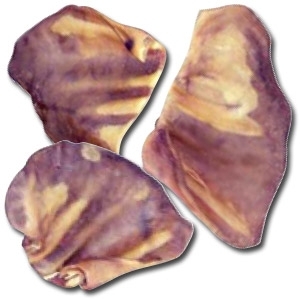 They are also a mild liver and digestive stimulant that may help promote waste elimination. Healthy digestion is vital to support your dogs' overall health. 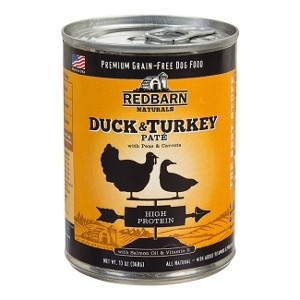 Redbarn's Duck & Turkey Pate has high-quality Duck and Turkey as the first ingredients. We added Salmon Oil, rich in Omega-3 Fatty Acids, which help to support healthy skin, coat and joints. Added Vitamin E is a strong antioxidant that promotes immune health and provides anti-inflammatory properties. All of the Redbarn Pate Recipes have ten ingredients or less* (* Plus added vitamins and minerals).